Kilsyth Rangers moved up to fourth in the Championship table with a thumping 6-1 win over Neilston at Duncansfield Park on Saturday. The unexpected margin of victory came from one of those days for Rangers when everything went right for them and although Neilston fought well they had little luck in front of goal. Sta of the show was Scott Upton whose hat-trick was reward for a very good performance. On a perfect autumn afternoon Rangers were looking good from the start but it took them 20 minutes to open the scoring; a free-kick into the box was not properly cleared and Danny Smith struck home a curling shot which keeper Marc Wilson was unable reach. Neilston were showing some nice touches at times but lacked a finishing touch. And they were punished almost on half-time when Wilson failed to hold a shot, allowing Salim Kouider-Aissa to scramble the ball into the net and give Rangers a two-goal advantage which was perhaps a true reflection of the first half. Neilston opened the second half quite well but again they had little to offer up front. There was nearly another for Kouider-Aissa when he broke awy and lobbed the ball over Wilson but it was slightly off target, the ball just trickling past the left-hand post. However a minute later Rangers did get a third goal when Upton nodded in a long pass from wide right. Upton then made in two goals in two minutes with another strike following on from some fine play. 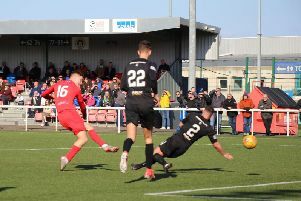 Neilston did pull one back when former Ranger Paul Stewart netted but within a minute it Kouider-Aissa got his second to retore the four-goal margin. Upton completed his hat-trick late on to make it six, although Neilston were down to ten at this stage having already utilised all their substitutes.